Block H is an interactive installation comprised of two parts. Its name originates from The Maze/ Long Kesh prison and H-Blocks that held paramilitary prisoners up until recent times. 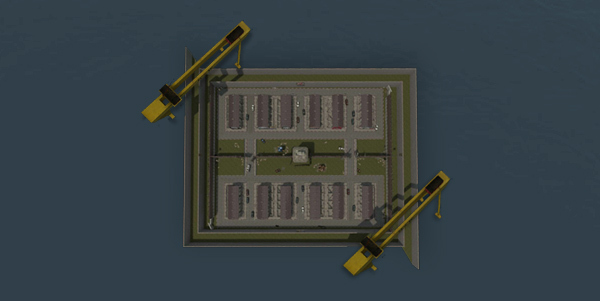 The housing estate (Block H) featured in the Counter-Strike mod presents a comparable sense of confinement. 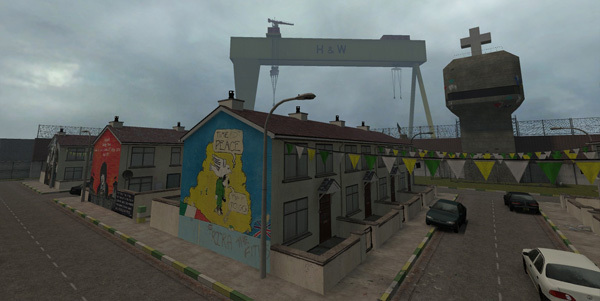 This video game world simulates the outside environmental influences of Northern Ireland such as sectarian murals, while the sound reactive television in the installation interior considers people's relationship with the media and its icons. The project was originally conceived as a way of documenting the murals that are fast disappearing from the landscape of Northern Ireland. 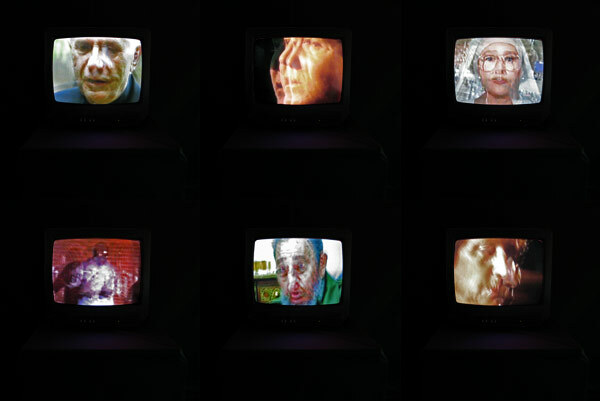 Block H has developed from there to explore the wider themes of media and social memory, surveillance and censorship, and the military entertainment complex. When is it appropriate to use real violence as entertainment? How much is our perception of conflict affected by the media and our peers? Does erasing murals while building more walls bring us closer to reconciliation? How analogous are the objectives of either community? The game uses a first person perspective multiplayer engine. 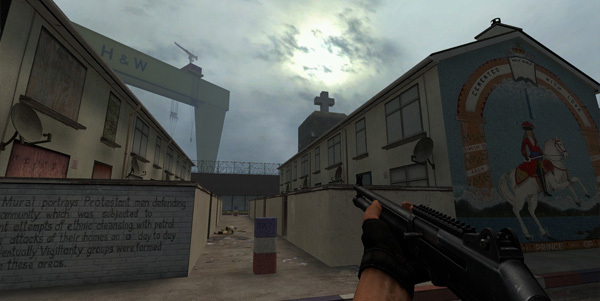 it is a Counter-Strike Source mod which can be played on a local network or over an internet connection. Teams are split into Loyalist and Nationalist. Players wear Celtic and Rangers jerseys, denim jackets and anoraks. They are situated in a housing estate split by a peaceline and watchtower. Each side has its own versions of sectarian symbols: murals, bonfires, flags, drums, graffiti etc. 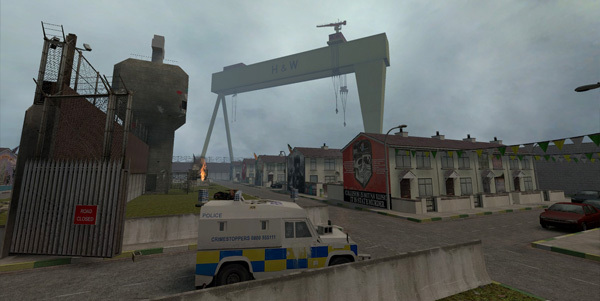 Details were based on hundreds of reference images to create a composite environment of Belfast and Derry. The sound reactive television was made using MAX/MSP. It uses footage of cultural icons as well as victims and perpetrators of violence during "The Troubles". The audio and video channels are changed separately by the user using a two button remote control. The images stutter themselves in real time to synchronise with any one of the soundtracks. The game is projected on two translucent sides of a white tent. There are two accompanying player interfaces outside the tent, one for each team. 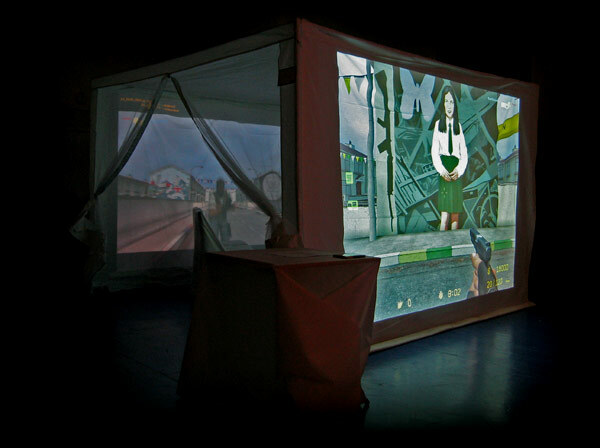 The television and remote control are situated inside the tent, where the reverse of the outside projections is also visible.